Not that long ago, I came in touch with Raffaele Pezzella, a Naples-born artist who is even older than I am (two years and a handful of days more of age). In his late twenties, Raffaele started experimenting more actively as sound artist, and especially electronic research, as well as some guitar-based improvisation, became his main topics. His first steps into sonic areas also concerned mastering and mixing duties for other artists all over the globe. There were a couple of recordings he registered for himself, but it took until the beginning of this decennium before the guy started his solo outfit called Sonologyst. As from then on, there were a couple of different recordings, initially especially via one of the most influential and productive yet largely underestimated (online) labels, Petroglyph Music, as well as via other notorious labels such as Attenuation Circuit (the Emerge platform), Sirona Records or his own Unexplained Sounds Group. Besides this last-named label (which is also home to a blog and radio emission), he also started Eighth Tower Records not that long ago. I wrote some reviews in the recent past for them, and several more will follow for sure! 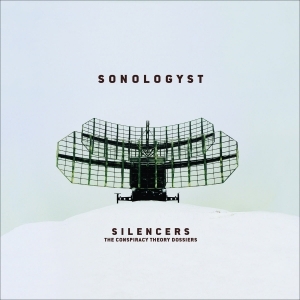 Anyway, as Sonologyst, Raffaele wrote and composed the Silencers (The Conspiracy Theory Dossiers) album a couple of years ago. It was released via his own Bandcamp profile in October 2015. However, due to (or better: thanks to) the intelligent question of the Cold Spring Records crew being something like ‘why not promoting this fabulous and way too unknown stuff?’, this ten-track album has now been reissued on compact disc (digipack with eight-page booklet, being ‘a short recognition’ of the guy himself). The whole thing has now been mastered at the legendary Cage Studio by, of course, Martin Bowes himself. The liner notes deal with the different theories on the so-called men in black or silencers, the existence (and denial of it) of extra-terrestrial lifeforms or alien civilization, and the possible contacts that took place on our own Mater Terra with unworldly intelligence. Silencers (The Conspiracy Theory Dossiers) lasts for fifty minutes and can be considered some kind of sonic sci-fi documentary on the subject of alien encounters (and related things), based on conspiracy theories, official and / or classified documents, hypothetic approaches on the matter, and different testimonies. The simple artwork goes very well with the subject, for the soberness focuses on this specific theme, making abstraction of any distraction. Great. I’d like to refer to enchiridion books / articles by e.g. Richard Dolan and Bryce Zabel (authors of A.D. After Disclosure), Gareth Medwey or the liner notes by the artist himself. Sonologyst work with experimentational elements in sound, mingling different sound sources and samples, sound processing, pulses and oscillations, synthetic manipulation, electronic aspects, electro-acoustics and guitars. But above all, this combination of factors results in a weird, special, psychedelic and gloomy aural journey. The artist surely knows how to create an astral atmosphere, and there is no doubt that the main theme indeed deals with outer space and beyond, and nearby. There is some improvised attitude going on, I feel, with a natural flair courtesy of this project. Despite a certain dissonance and a permanent discordant unease, there is like a linear para-mental attitude, being both illuminative and oppressive, both desolate and infinite, both post-realistic and imaginative, oneiric and paranoid. It’s like a soundtrack for that uncomfortable of feeling alone, left alone in an immense, immeasurable empty space, a vast emptiness while feeling like you are being watched. Via droning soundwaves, electronic devices, pulsating rhythms and ominous sound collages, Silencers provoke to levitate above one’s physical shape, without turning into a meditative or ritual trance (which I never dislike, of course, but which is not necessarily needed right here). Haunting ambience defines the better part of the album, once in a while almost Lovecraftian in nature (like in the fabulous yet asphyxiating drone-works Nocturnal Anomalies or Close Circuit, amongst others). Other moments are characterised by contorting drama, then again it’s like a minimal expression of infinity and nothingness at once (cf. a noisy-distorted piece like Anamorfismo with those hints of audio frequencies and unprogrammed machinery noises). The borders of Psybient Electronics get crossed through pulsating outbursts à la Secret Societies. The Kennedy Speech, a piece like a cosmic whirlwind, enriched by a speech of, indeed, some notorious politicians from the New World, and a permanent self-repeating loop in a mostly neurotic vein.